Dr. Michael R. Schwartz says a Mommy Makeover can improve many of the physical changes a woman’s body goes through during pregnancy and while raising children, helping to reverse problems that can’t be corrected through traditional diet and exercise. 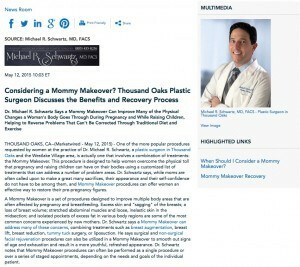 Thousand Oaks, CA – One of the more popular procedures requested by women at the practice of Dr. Michael R. Schwartz, a plastic surgeon in Thousand Oaks and the Westlake Village area, is actually one that involves a combination of treatments: the Mommy Makeover. This procedure is designed to help women overcome the physical toll that pregnancy and raising children can have on their bodies using a customized list of treatments that can address a number of problem areas. Dr. Schwartz says, while moms are often called upon to make a great many sacrifices, their appearance and their self-confidence do not have to be among them, and Mommy Makeover procedures can offer women an effective way to restore their pre-pregnancy figures. A Mommy Makeover is a set of procedures designed to improve multiple body areas that are often affected by pregnancy and breastfeeding. Excess skin and “sagging” of the breasts; a loss of breast volume; stretched abdominal muscles and loose, inelastic skin in the midsection; and isolated pockets of excess fat in various body regions are some of the most common concerns experienced by new mothers. Dr. Schwartz says a Mommy Makeover can address many of these concerns, combining treatments such as breast augmentation, breast lift, breast reduction, tummy tuck surgery, or liposuction. He says surgical and non-surgical facial rejuvenation procedures can also be utilized in a Mommy Makeover to smooth out signs of age and exhaustion and result in a more youthful, refreshed appearance. Dr. Schwartz notes that Mommy Makeover procedures can often be performed as a single procedure or over a series of staged appointments, depending on the needs and goals of the individual patient. While the Mommy Makeover recovery process is dependent on the specific treatments and the unique physical needs of each patient, Dr. Schwartz says women should prepare to have at least a few weeks of downtime after treatment, particularly if they are having major surgical procedures performed in tandem. He notes that strenuous activity should be avoided for at least six weeks after the procedure, and that there will likely be swelling and soreness in the treated areas; however, he says, pain medication can often minimize discomfort during the healing process. Dr. Schwartz says he typically advises patients not to have a Mommy Makeover until at least six months after their last pregnancy, since some issues may resolve themselves in that time. He says women should also be sure that they are not planning to have anymore children, because a future pregnancy may negate the results of a Mommy Makeover. Overall, Dr. Schwartz says, Mommy Makeovers are custom-designed for each individual patient, allowing for specific problems to be addressed in a comprehensive treatment. He says women who are considering a Mommy Makeover should consult with a board-certified plastic surgeon and talk with him or her about all aspects of each option that can be part of the treatment, including risks, benefits, and potential results. Dr. Michael Schwartz is certified by both the American Board of Surgery and the American Board of Plastic Surgery. He has been in private practice since 1998. A Fellow of the American College of Surgeons, Dr. Schwartz holds memberships in the American Society of Plastic Surgeons, the American Society for Aesthetic Plastic Surgery, the California Society of Plastic Surgeons, and many others. He earned his medical degree from the Baylor College of Medicine in Houston, Texas and completed his Plastic and Reconstructive Surgery residency at the University of Texas Southwestern Medical Center. Dr. Schwartz is affiliated with a number of hospitals and surgery centers in the Westlake Village, Thousand Oaks, and Camarillo, California areas. He is available for interview upon request. For more information about Dr. Schwartz and his practice, please visit drschwartz.com and facebook.com/drmschwartz.